Imagine my surprise when I logged into a ymail account that is TOTALLY separate from this blog and saw blog posts going back to Dec 6, 2008 in someone else’s Yahoo account. I log into lots of other people’s email and AdWords advertising accounts and that causes some serious problems. Did you know that if you log out of one Google account and do not log into another Google account that everything you do is placed in the Google history of the account you were last logged into? do searches for one client that end up in the history of another. You can clear Google Search History but is it REALLY cleared? The screen capture below shows the page in that Yahoo account that appears when I went straight to mail.yahoo.com – that account has this page but other ymail accounts I checked do not so this could be something new they’re testing or rolling out OR it could be some setting. 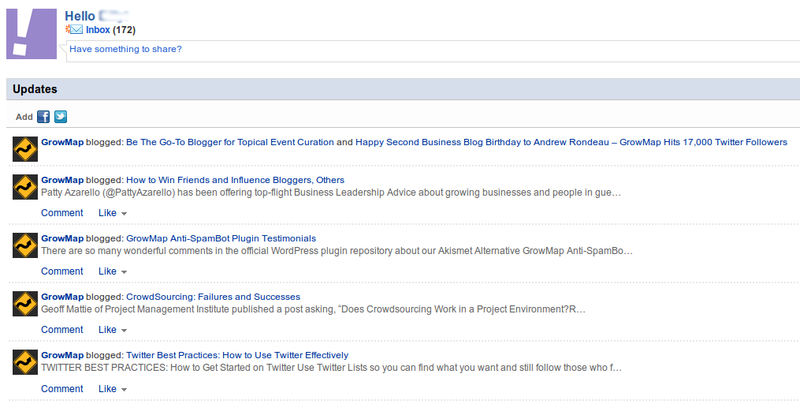 I would definitely NOT choose any setting that would add content from unrelated blogs into any Yahoo! email account so either that is the default OR they will claim it was a computer glitch. I found settings in Contacts toturn off Share My Updates and See Updates in Yahoo! Mail (screen capture below). It pulled Melissa from a reply made from that email account to someone in a Yahoo! Group so this thing automatically accumulates your activities in whatever Yahoo! can track. This updates feed also included reviews I wrote as GrowMap on Yahoo Local. I am turning this off in every account. If you don’t want to be tracked everywhere everywhere you go, I would turn it off – but realize that it probably doesn’t actually stop them from storing all this information. All it does is make it less publicly available to you and other Internet users. I was in a dialogue with a distant relative via email. This relative had not seen or heard from me in 20 years. I temporarily forgot where I was during our email exchange [which was on Yahoo.com email ] and told her my age. Within 48 hours my age appeared in my Youtube.com channel, without my consent, without my permission and without me even knowing it until I logged and found it posted. I quickly deduced where this information had been datamined from. Someone from Yahoo.com had provided it to Google, which owns Youtube and it appeared in my Youtube account so quickly I was stunned. And furious too. I need to warn all readers and subscribers not to EVER discuss anything of a private or confidential nature on yahoo.com email. Your emails are being archived, examined and harvested for details about you with each send. I have been telling trusted people for many years there is only ONE BORG and Microsoft / Bing, Google, Yahoo!, Facebook, Twitter are all part of it and they all SHARE DATA. Even the wise people I know have trouble believing that, so you have to pay attention to the patterns! Any company that is suddenly mentioned – as Twitter was – on the same day across every Major Media site – is part of that Borg. No PR agency is so good they can get your company mentioned ON THE SAME DAY on the late night news on EVERY CHANNEL, in the soap opera episodes that day, on the prime time shows, the reality shows and even OPRAH – all on the same day. Wake up, people. Stop rationalizing so you can ignore the obvious! Between setting cookies of more than one kind on your site and trying to get us to stay logged into Chrome on multiple devices, we are tracked everywhere. But those of us who use other people’s accounts are concerned how that may impact them – and us. i hate it when google does stuff like that.. it;s not ok at all ! dunno if i’m alowed to share, but here’s a video which this post reminded me of..
terrible! i don’t agree with this at allmaaan, i hate when stuff like that happen.. they now everything about u, u’re darkest secrets by looking at your search history! it’s kind of creepy..
Maybe I really am blind, but I don’t see all the big names work together. I do realize the threat coming from big corporations like the big G.
That Google/Yahoo store all that history in such a way is very annoying and I will be more carefull now I know. Thanks! You have to look at their activities over many years and the connection between the media coverage of each company and the stock prices. The same few wealthy elite have so much money they control all the companies. 7) Let company A fail – who cares – the wealthy few already got out, leaving all the “suckers” (make that everyone from pension plans to ordinary investors to millionaires who THINK they’re part of the select few but never will be) to lose everything. Works like a charm every time. Those who do not study history are destined to repeat it. i hope many people stop ANY use Google & Co. I learned many years ago that you do not place anything online (email, private messaging, IM, etc..) that you would not want plastered across the net. There are too many feeds and links that could get misdirected. Don’t place anything on line you do not want shared. But, emails are also fair game. Nothing is really free, is it? Did we all think these “free” services didn’t have a cost? Many people did, but I’ve been writing posts about it like this one from September, 2008: When FREE Is Definitely Not: What Those Free Services Are Really Costing You. I’m old enough to remember the saying “there is no free lunch”. We’re paying and the price is WAY too high. OMG. I never heard about this information before. Your post is a precaution to a user of Y G mail user. There is no privacy if we use some one’s product like google, yahoo and etc. wow! thanks for good information. we must take care of this point while using google and yahoo. keep posting on. 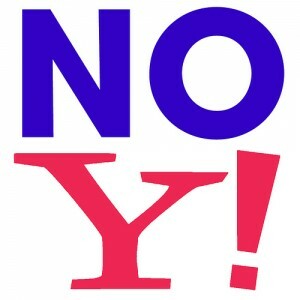 I was stopping using Google because they do not respect privacy and I now use … Yahoo ! Yes, pretty much. We really need INDEPENDENT alternatives, but many of those are actually secretly controlled by the same people so we have to figure out which really ARE independent – and then encourage them NOT to sell out. Well thats something very serious and G and Y should take care of it. I am surprised by this information thanks for sharing..
I’ve long known about the lack of respect of privacy on the internet, however Google and Yahoo sharing data (and possibly other companies —- theBorg) between each other is a surprise. My initial thought was thank god I got myself a private email address but then again, 90% of the people I email are using free services so it’s an easy job for them to profile me. We have a private company website that requires login but some of the internal urls appear in google’s Index when you do a site: search. The only way I think Google might have pulled that out was because a few us were using the pagerank checker on FF. Yes you could say we are at fault because we didn’t include meta=noindex,nofollow on the pages, but then again they were private pages that requires authentication before someone can access it. I think facebook is the worst of all since people willingly submit their names, ,phone number, the people they know, what their likes and interest are, and more recently, they released a feature that allows people to tag family members. Oh boy! it really makes it easier for them once the crackdown starts. We’re in the panopticon already. Forgive me for saying so, but this is not news. Information sharing and being available on the internet (even on sites that you *didn’t* originally authorize) has been around for a long time. If you make it available in one place, by virtue of how everything is connected on the web, it’ll eventually be available everywhere. And there are websites which bunch up all your little factoids together in one place, but it’s not technically an invasion of privacy because you *did* make it available somewhere else. Kind of like the White Pages. People’s phone numbers and addresses are in there for anyone to find, but no one complains? Why should the internet be any different? It is not news to those of us who have been online from the beginning, but it IS news for the majority of Internet users. The danger is that this information is being aggregated now. When it existed in completely separate places it was far less dangerous to us. Most people do not realize that their medical records are widely available for sale. I am certain that most people believe that what they tell their doctor is private. It definitely is not. Employers and insurance companies have access and I would not be surprised if banks and the government do too. If you belong to a private community and share personal details there that should STAY THERE inside that private community and members should NOT EVER share that information anywhere else. Unfortunately, you have to trust the community owner not to sell your information and since you probably can’t – or even if you could they might sell out to someone else who won’t protect your privacy – EVERYTHING you share online should be considered public. The subject discussed at the bottom of this post is different. That information was taken FROM AN EMAIL. How many people believe that email communications directly between themselves and one other are private? Surely most people have an expectation of privacy and believe what they send in an email to a family, friend or business associate is private. This proves that both Google and Yahoo take information from private emails and share and publish it online and archive it as well. This is NOT right. It really isn’t. And speaking of white pages. Many of them now list the ages and names of children, your relatives, and all kinds of other information. Do people realize how dangerous that is? If someone approaches your child and knows the names of everyone they know that child is likely to accept them. If someone goes to your child’s school and has family details many people will believe them and let them take your child. That information SHOULD NOT be so easily accessible publicly. Con artists with personal information can and do take advantage of people every day. I’ve had multiple businesses accept stolen forged checks that had only my name on them (I am female) from a person who was male because the person passing them was charming, presentable, and knew a lot about me. THAT is what can happen. As for where Google Yahoo Bing Facebook Twitter – what I collectively call The Borg – is going read my Crowd Sourcing post. I find facebook more aggressive and intrusive than google. I recently was made aware that facebook sells personal information to marketers. I recently got a notice from Hallmark Cards about someone’s birthday and urging me to sign in to their site and send an electronic card. Well this is very scary news. Thanks for an alert. I spend a lot of time trying to find ways to protect my information, as well as my PC. I never knew about any of this and I use Google for everything. I have multiple accounts for different things, and it bothers me to know that stuff can get lumped in together. You have done a lot of research on the above mentioned issue. Can you explain me what is its remedy? I really never thought about what you wrote until I read some of the posts and realized that I need to stick with my personal pc for personal issues. I guess I never have been to a kiosk or public place and put my private information in there. I have however been at a hotel in the past and used a pc there. I have never noticed that it caused any issues, but that was years ago. I don’t thing so! I agree that twitter, facebook etc are the medium of sharing data but Google and yahoo share data with each other, this is pretty unusual. 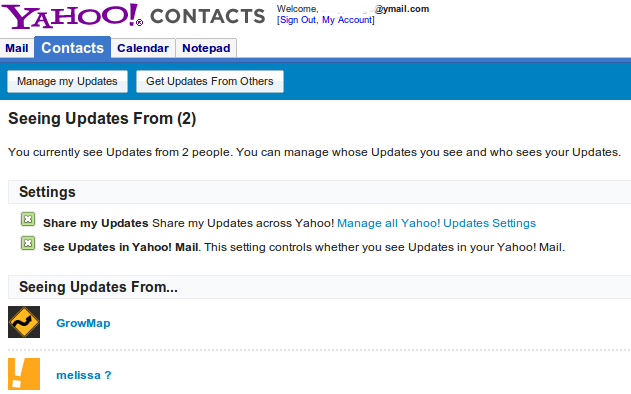 Only what you can search for yahoo mail and Gmail is the basic detail about a user who allows to do so. This is a big privacy issue. I am not even aware that it occur. What will I do? I personally never like to access important accounts (banks, main email, etc.) from computers that are not mine or that I have no control over. I already feel insecure even on my personal computers. Because you never know what’s in other persons computers. They (the owners) may not even know what’s on their computers either. There’s a lot of spyware and malicious software that can almost self-install and most of the average users won’t even realize it. It could be, but it doesn’t have to be. 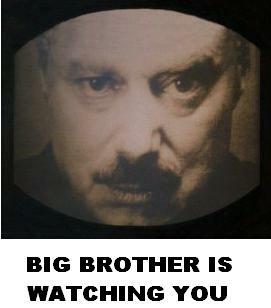 There are so many ways we are being tracked now. It could be cookies being set on our hard drive, or information saved by a browser, or one of many other methods being used today. Do you know how to turn off that synchronizing data feature in any specific browsers? We use different browsers so they will NOT synchronize and we can log into more than one account at a time. I dread the day when the various browsers decide to sync to each other. Okay, got it. Yes in Google Chrome you need to go to the ‘Customize and control Google Chrome’ option and then go to the Option menu. In Option go to the Personal Stuff where you will find the option to Stop Syncing browser stuffs with your account or even Customize it. In Firefox I have not seen such option yet. And since I use IE less, so I did not check the options there. But I will definitely let you know again if I get to see such options in the other browsers. And, regarding using different accounts in one browser, so far as I know, the facility is available only with the Google email accounts – both free and for organizations. You can sign into another gmail account in the same browser by turning on ‘multiple sign in’ option from your google account settings. And yes, that may be another matter of concern when the different browsers decide to sync to each other. But then they should provide option to turn it off. For the moment the browser bookmarks can be imported from one browser to another. Hope I could explain you. Thanks. You are absolutely correct. Imagine your searches for one company you signed a non-disclosure agreement being visible in another client’s account. Maybe that client would not notice or know what it was – but it is also possible they might know someone who was a competitor and ask them about the results in all innocence. Corporations do not think of the individual problems they can cause because they are not concerned with any of us as human beings. They don’t think about the fact that cross-contamination could cause someone to be judged for something they never did themselves. People have only to watch the CSI type shows on television to see how most people have poor critical thinking skills, making assumptions and leaping to conclusions that are not necessarily true. If we think innocent people are being locked up now wait until law enforcement types get their hands on this kind of data. I have been writing about many other issues related to this stuff for years now. Those interested should look at my other posts on Data Mining and Privacy issues. I am afrai the same thing about Facebook. Are the photos and other information which you delete really cleared? It wouldn’t surprised me if everything was cached somewhere. You are absolutely correct. Everything IS being stored now that storage costs have dropped and computer access speeds are much faster. Anything you have ever typed into an IM chat or Skype or on any site anywhere has probably been saved. Whether they could effectively retrieve is another story because the databases used to be separate – but more and more of them are being assimilated. Here is a tip for anyone who is concerned about what they have shared. If you can not remove existing information the best way to make sure it can not be used against you is to add tons of disinformation. That way if someone wants to build a profile they can not just pull the data. They will have to figure out which version of every piece of information is the correct one – and which is false. I encourage anyone interested in privacy and How Data Mining Works to click that link and read some more of my posts about it. Profiles can be used to keep you from ever getting another job, or renting an apartment, or buying anything, or getting insurance. Those who feel the need for insurance or jobs must understand how this works. Personally, I will not ever have a J.O.B. (Just Over Broke) again nor do I have insurance of any kind for anything. It is unnecessary when you walk with God and supports evil systems that are regularly used against us. Such articles always makes me feel a bit insecure. With so many ID thefts and hackers around the corner we just have to be very careful all the more specially with anything related to our sensitive information. What can be worse than to find someone using our account without our knowledge? I’m more careful after that!! Thanks so much for sharing such an important and crucial article. I need to check on some settings too. Thanks for the heads up. I hate this kind of tracking, and now it seems like so much work just to hunt down the places where we can actually turn some of this stuff off. Great, I am positive now that everything I do on the internet is tracked in one manner or an other. I guess as long as we use their turfs as our playinground it’s bound to have our movements tracked. A solution would be to surf the internet in anonymous mode (or incognito ) and clear all cookies after you log out. You could also have a private VPN and surf the net through that, but I don’t think this should be necessary and all sites should give you the possibility to delete all private data they have about you. Yes, everything we do online IS tracked as anyone can find out by reading those posts and doing online research. I have no way to know how anonymous surfing anonymously truly is but I am certain there are people who can figure that out for us. It is unfortunate that the innocent and the most guilty are in need of the same thing: a way to be left alone. Thanks for the head up! I had no idea but on occasion have found things just like this going on with my ymail account tracking and showing my information publicly. Big Brother is in full effect. Thanks for the heads up. I hate this kind of tracking, and now it seems like so much work just to hunt down the places where we can actually turn some of this stuff off. Then you hear of one more thing being tracked. Also, the separate email accounts is a great idea. I do the same. Hi – I have exactly the same thoughts as Ileane, I sign in and out of various Google accounts and in the past have noticed some really strange occurrences, like details from one account appearing in the other and so on, this has been notice in GA and also G WMT! A bit concerning but have in the past just thought oh well nothing I can do about that! I would love to hear more peoples views, experiences and opinions on the affects and solutions for these issues… GREAT POST THANKS FOR WRITING THIS UP! I first saw this problem back when I managed ppc accounts – primarily Google AdWords – and started seeing search history showing up in the wrong accounts. I was just lucky I caught that early on. I was always careful to log out BUT what Google, Yahoo! and others are doing is putting history into the last account you were in UNLESS you log into something else proactively. This is a VERY serious issue for consultants. Imagine your searches for one client who sells something that uses a search phrase that turns up adult results appearing in another client’s account who is very religious or sensitive to that kind of thing as many of my Mennonite clients would be? The most innocent search can return inappropriate results. Years ago I was showing a bright little girl how to use the Internet and searched for “baby doll” looking for a doll for a little girl that was an infant doll. Boy was THAT a mistake. I need to write a post calling on those of us who are older and wiser to share with younger people was is and is not appropriate in their photos, behaviors and writings. What when I was growing up would only be seen in a seedy peep show is now all over prime time TV, in the movies, on billboards, etc. so they do not know when they are waaayyy over the line for what would be socially acceptable to older adults. It is up to us to provide some clear guidance because the major media and the educational systems and their parents are not doing it. I realize about all this and sometimes worry about how the information is used but nothing much can be done about this. We are using their free service thus they secretly watch what we are doing from afar. Thanks for pointing out the method to turn off all the auto update sharing in Yahoo. That is what many of us do and why I wrote about this again. Even though you are careful to log out each time, if you don’t log into something else right away what you do in between gets put into the last account you were in.